The San Diego Jurassic Park cobblestone amphitheater completes the castle imagery of the witch’s circular ramparts behind the torch-burning front gate. Our protagonists bound through a field of high grass, bringing to mind WOO’s poppies, before reaching what they believe will be their sanctuary, the old park headquarters. Reaching there will supposedly provide the solution to their problems like Emerald City’s false promise lured WOO companions. See Saving Private Ryan, The Color Purple, Always for fields. A little boy in San Diego wakes form sleep to see T-Rex out his bedroom window. 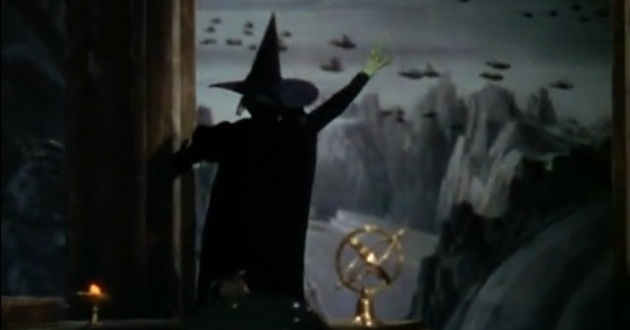 Dorothy also saw surreal imagery out her bedroom window inside the tornado. See Empire of the Sun, Catch Me if You Can, Schindler’s List. When Sarah shoots the T-Rex mother with tranquilizer dart, the seemingly invincible dino sinks into the hold of the ship moaning as its grate covers her. She comes off as incredulous as the witch…”What a world. Who would have thought a good little girl like you could destroy my beautiful wickedness. Ooooh” See Raiders of the Lost Arc, Gremlins for more melting. When we toured Warner Brothers, our guide led us on a short-cut through the studio’s prop warehouse. There we took a quick picture of one of our group goofing around with a plastic severed arm. 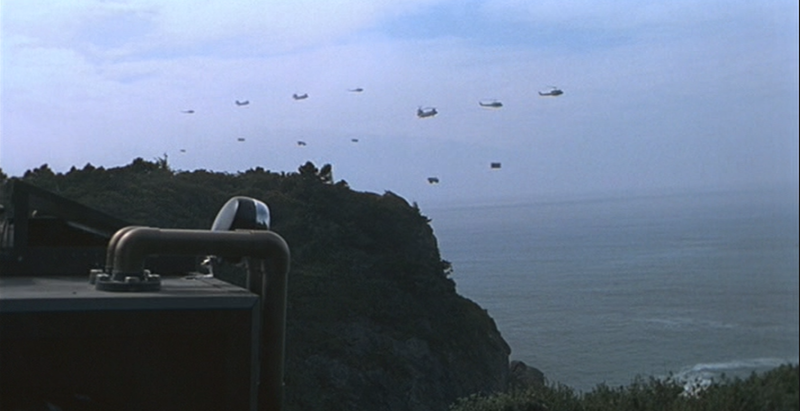 So weird… because as I re-watch these Spielberg films, that arm—or one like it— keeps turning up! In the morgue scene in In Private Ryan on the beach a soldier picks up his detached arm and staggers off with it. 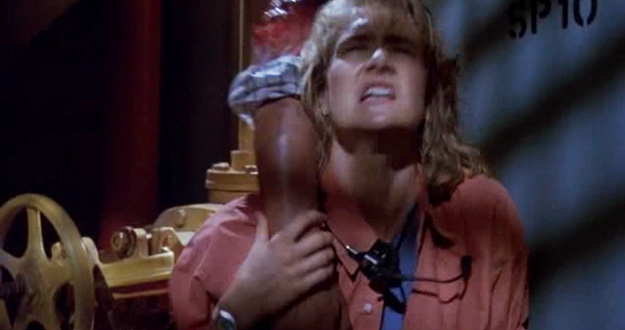 In Jurassic Park at one point someone discovers an arm without it even being clear to whom it belongs, just a sign that dinos have been there. In Lost World, we see it attached to the controls of the ship. In Joe Vs. the Volcano Joe fiddles with a prosthetic arm to his boss’s consternation. It even popped up in A.I. when the robots were scavenging for spare parts How does this relate to WOO? Not even sure it does. Just an odd repeating detail. However, one of the scariest moments of WOO to me as small child was when the monkeys have torn Scarecrow apart. He gestures, still alive but dismembered. He complains his legs are over there. Did his frantic gesturing arms look detached? Can’t remember. I usually closed my eyes not to have to look! Note: later learned Steven used to hang out at Warner Brothers…made friends with guards…watched directors. Did he also get to explore the prop warehouse? Did he daydream where and how he would one day use that plastic arm?